Eight new stocks make March’s Exec Comp Aligned with ROIC Model Portfolio, available to members as of March 15, 2019. The success of this Model Portfolio highlights the value of our Robo-Analyst technology, which scales our forensic accounting expertise (featured in Barron’s) across thousands of stocks. This Model Portfolio only includes stocks that earn an Attractive or Very Attractive rating and align executive compensation with improving ROIC. We think this combination provides a uniquely well-screened list of long ideas because return on invested capital (ROIC) is the primary driver of shareholder value creation. Insight Enterprises (NSIT) is the featured stock in March’s Exec Comp Aligned with ROIC Model Portfolio. We highlighted NSIT as a Long Idea in August 2018, and since then it has outperformed (+2% vs. S&P -1%). Despite this outperformance, the stock remains undervalued. Since 2015, NSIT has grown after-tax profit (NOPAT) by 25% compounded annually. This profit growth has helped NSIT improve its return on invested capital (ROIC) from 7% in 2015 to 10% in 2018. As Figure 1 shows, NSIT’s ROIC has grown faster than its weighted average cost of capital (WACC) over the past four years, which drives growth in economic earnings, the true cash flows of the business. NSIT executives receive long-term equity compensation in the form of performance and time-based restricted stock units (RSU’s). The performance-based RSU’s account for 60% of long-term executive compensation and are tied to non-GAAP ROIC performance goals. RSU’s made up 43% of the CEO’s pay in 2017 (the most recent year for which we have data) so it is no coincidence that NSIT has improved ROIC in recent years – executives’ bonuses depend on it. The focus on improving ROIC aligns the interests of executives and shareholders, helps to ensure prudent stewardship of capital, and lowers the risk of investing in the business. At its current price of $56/share, NSIT has a price-to-economic book value (PEBV) ratio of 1.1. This ratio means the market expects NSIT’s NOPAT will grow by no more than 10% for the remainder of its corporate life. This expectation seems pessimistic given NSIT has grown NOPAT by 12% compounded annually over the past two decades. 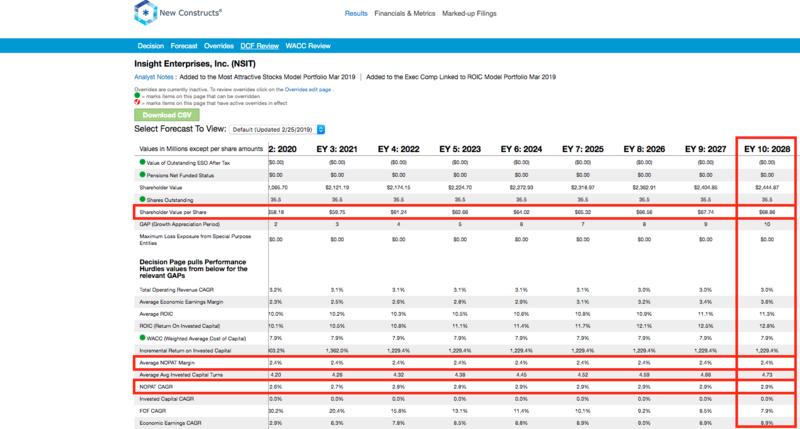 If NSIT can maintain 2018 NOPAT margins (2%) and grow NOPAT by just 3% compounded annually over the next decade, the stock is worth $69/share today – a 21% upside. See the math behind this dynamic DCF scenario. Income Statement: we made $61 million of adjustments, with a net effect of removing $7 million in non-operating expenses (1% of revenue). You can see all the adjustments made to NSIT’s income statement here. Balance Sheet: we made $602 million of adjustments to calculate invested capital with a net increase of $494 million. One of the largest adjustments was $432 million in accumulated asset write-downs. This adjustment represented 35% of reported net assets. You can see all the adjustments made to NSIT’s balance sheet here. Valuation: we made one adjustment with a net effect of decreasing shareholder value by $260 million. There were no adjustments that increased shareholder value. Despite the net decrease in shareholder value, NSIT remains undervalued. You can see the adjustment made to NSIT’s valuation here. This article originally published on March 22, 2019. To learn more about David CLICK HERE!